GETS TO THE ROOT OF THE PROBLEM: While drugs typically only cover up pain and symptoms and are 15-20% effective, Flexpet goes to the root of the problem where it is 80+% effective. ALL NATURAL: Flexpet is an all-natural joint supplement that is safe for your pet, and does not interfere with other medication your pet may be taking. 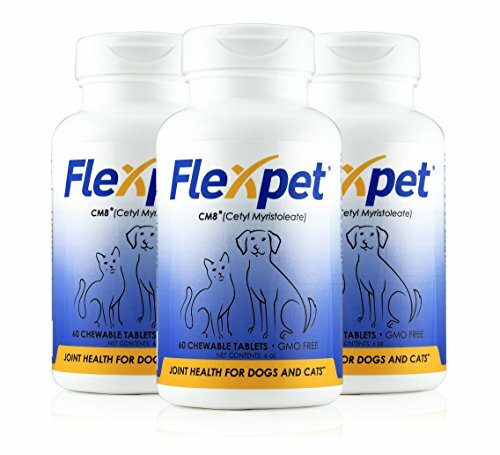 THE ONLY SUPPLEMENT WITH CM8: Flexpet is the only supplement that contains the natural ingredient Cetyl Myristoleate (CM8). This is a natural ingredient that lubricates and reduces swelling in the joints, and is not available anywhere else. NO NEED FOR POTENTIALLY DANGEROUS PAIN MEDICATION: Ibuprophen and Acetaminophen can be exceedingly dangerous for dogs, while Tylenol can be harmful over a longer period of time. Flexpet reduces the need for ongoing pain medication for your dog. ELIMINATE THE NEED FOR SURGERY: In many cases, dogs taking Flexpet are able to eliminate the need for costly surgeries. If you have any questions about this product by Flexpet, contact us by completing and submitting the form below. If you are looking for a specif part number, please include it with your message.